Purchase a rain sensor and receive a Utilities' rebate. Yes. Our technicians will install the thermostat inside your home. You must schedule an appointment and a responsible adult over the age of 18 must be available to allow our technician entry into your home to perform the installation. The responsible adult must also know the password of your Wi-Fi router to successfully connect your new thermostat with the internet. Installation of the new thermostat and removal of your old thermostat will take approximately one hour. However, our technician will help you program your new thermostat and answer any questions you may have. Generally, installation takes place within one month of your enrollment. However, you can schedule an installation at your convenience, including Saturdays. If you have a question about your thermostat installation or about the program, call us toll-free at 855-350-1464 between the hours of 8 a.m. to 6 p.m., Monday through Friday. If there is an issue after 6 p.m. on a weekday or weekend, an after-hours technician will be available for emergency calls. The technician may determine that your air conditioning system either (a) has a problem that prevents installation without repairs being done first, or (b) is not compatible with the thermostat being installed. If there are problems that can be repaired or remedied, the technician will explain the situation and your options, and you may participate once the system repairs are completed by your HVAC contractor. Note that our technicians are not allowed to make repairs for you. If there are fundamental or major problems with your system, or it is incompatible with the Peak Partners equipment, you will also be notified of the situation and what options you may have regarding program participation. 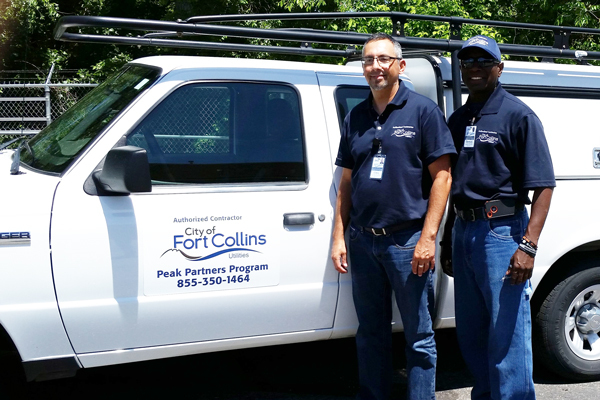 If it's of assistance, Fort Collins Utilities, in collaboration with Platte River Power Authority's Efficiency Works for Home™ (EW-Home) Program, maintains a list of residential mechanical system contractors who have met certain training and quality installation practice requirements. The list of participating contractors can be found on the Efficiency Works site at: https://efficiencyworks.co/find-a-provider/.